As a self-identified tech geek, Dima Elissa has always been an early tech adopter. When a friend waxed lyrical about the benefits of on-demand 3D printing a few years ago, she was immediately hooked. Elissa and a partner launched ProofX, a rapid prototyping firm, which provided her with the foundational knowledge and experience to stand on her own two feet in the burgeoning additive manufacturing industry. The more she kept digging, the more the implications of 3D printing rolled out in front of her. She launched VisMed-3D in 2014 with medical applications as the focal point of the business and is now one of 60 healthcare startups located a Matter, a health tech incubator space in the Merchandise Mart, just down the hall from 1871. The currently self-funded consulting and research startup focuses on 3D printing technology that helps surgeons, health care providers and universities create physical replicas for state-of-the-art treatment and training purposes. 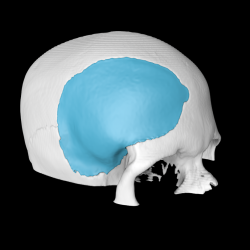 Patients undergo pre-surgery MRI scans which are digitally combined into 3D images and printed. his 3D technology enhances “personalized medicine,” Elissa (pictured left) said. “By moving medicine away from what is generally known or understood about the body into a space where each individual’s personal anatomy can be understood. When extracting a brain tumor, doctors can first see a 3D version and then extract it with unprecedented precision, accuracy and quality. This could revolutionize the fields of prosthetics, orthotics and even dentistry with custom implants, dentures and appliances. Bone, the ‘hard stuff,’ is easier to print than the ‘soft stuff’ like tissue and filament ligament VisMed-3D is working with material scientists locally, on the east coast and abroad to be first to market with a medical-use filament, which is concretely establish VisMed-3D in the medical 3D space. Elissa started out with a BA in Chemistry (and continued with an MBA in Finance) and her father is a well-respected cardiovascular surgeon trained at Northwestern, but isn’t jumping into such a new, hi-tech field a huge risk for an entrepreneur? Possibly, but not for Elissa, who has started 16 businesses over the years, teaches entrepreneurship at the Associated Colleges of the Midwest in Chicago, serves on the boards of Ms. Tech, Women in Bio, World Business Chicago and is on the STEM steering committee for the Aparecio Foundation, which provides mentoring to high-achieving, low-income female high school students. Chicago’s massive new Goose Island digital manufacturing facility UI Labs was built with $70 million in federal funds plus corporate matching to restore the city’s manufacturing heritage for the 21st century. Opened in early May, the space extends digital manufacturing to both large companies and small startups, said Dean Bartles, the Executive Director of the digital Manufacturing and Design Innovation Institute, the UI Lab’s research lab. VisMed-3D works closely with hardware accelerator Catalyze Chicago in addition to UI Labs for access to tools, hardware, equipment for prototyping. VisMed-3D is now actively looking for investment, opening an initial seed round this year to raise funds now that they have a solid market understanding. With the right strategic partners on board, Elissa is excited to springboard VisMed-3D into a deeper integration with healthcare.